An example of SCP-2431 after refolding but before modification. Special Containment Procedures: SCP-2431 is to be kept in a standard cell incubator within Site-234, at 37°C when not in use. Interactions with the anomaly should take place in a sealed, sterile, tissue culture hood under normal BSL-2 conditions. Research personnel should avoid direct physical contact with SCP-2431. Excess SCP-2431 should be disposed of using advanced prion sterilization techniques. Description: SCP-2431 is a misfolded cellular protein, ATP synthase1, which forms large, oily and viscous clumps. Each instance of SCP-2431 is capable of spontaneous replication, regardless of whether or not correctly folded ATP synthase variants are present, and will produce new misfolded proteins every 30 minutes. Upon reaching 78 g in mass, clumps will split into 15 new aggregates, and begin the process again. SCP-2431 masses refold into shapes that have been encountered in their environment, primarily through physical contact, however; they are also capable of rudimentary visual observation2. Random folding occurs by the aggregate reaccumulating into a single large clump before flattening out and then refolding, X-ray crystallography of single SCP-2431 manifestations has pinpointed several anomalous structural additions that may be involved in this process (See Addendum 13). When a conglomerate of SCP-2431 refolds into a new shape, it will begin exhibiting characteristics of the item it is imitating, subsequently, when exposed to images or origami constructs aggregates will refold to emulate the presented item (See Experiment log E-2431-01). Conglomerates exhibit a rudimentary form of shared sapience4, often refolding into items or shapes as a means of communication. SCP-2431 aggregates are capable of complex emotional expression and recognition through the use of specific shapes and forms, making them roughly equivalent in intelligence to a small child5. In some cases, SCP-2431 may develop an emotional attachment to research personnel that interact with them regularly. Instances use observation of the personnel they become attached to express this attachment by refolding into constructs that will elicit a positive response. SCP-2431 was first encountered outside of SCP-2378 by Foundation exploration teams. The following section is composed of the condensed and summarized results of all experiments with SCP-2431. All aggregates exposed to images were measured to be at a mass of 78 g.
Result: Aggregates split into 30 new instances, and began the refolding process. Upon completion, instances had refolded into origami dragons of varying size and color. Instances begin flying around the tissue culture hood emitting auditory calls commonly associated with mythical dragons, and emitting small sparks of light. Result: Masses split into 30 new instances. Aggregates refold into a variety of characters depicted in the stories of Momotarō. Refolded instances engage in a reenactment of the legend as written in a recently published children's book. Photograph/Origami construct: Origami constructs of a boy and a tiger. Result: Clumps split into 75 new instances, Instances refold into the shapes of the given boy and tiger, and begin to reenact various scenes from the Calvin and Hobbes comic strip series in Japanese. Prior to experiment 6, Research Assistant Bates observed several SCP-2431 instances refold as he was opening the incubator. Several conglomerates refolded into an imitation of Bates' wife7. Bates elicited a positive response of "joy". Several more conglomerates responded by refolding into imitations of his children. Photograph/Origami construct: Pages from a children's story regarding a sick girl and the legend of 1000 paper cranes8 inside the hood. Result: Conglomerates split into 45 new instances, 42 instances refold into a shape similar to that of a crane and begin to emit vocalizations and movement similar to that of Grus japonensis. The remaining 3 instances refold into numbers, reading 9, 5, and 8. Following experiment 6, Research Assistant Bates moved to put the predetermined number of conglomerates back into the storage incubator. As he was doing so, several SCP-2431 instances, which had not been removed from the incubator, refolded into imitations of medical equipment and medications, specifically syringes, scalpels, and pills. Photograph/Origami construct: One origami iteration of a Boeing B-17 bomber. Result: Aggregates split into 300 new instances, 150 of which refold into extremely detailed recreations of B-17's. Instances proceed to travel along the length of the tissue culture hood, and ascend into the air, flying in formation reminiscent of American Air raids in the European theater of World War 2. Instances are observed dropping small folded constructs similar to bombs which shatter into tiny protein fragments on contact with the surface of the tissue culture hood. 147 instances refold into the shape of a crane, as seen in the previous experiment. The remaining 3 instances refold into numbers, reading 8, 1, and 1. Over the next 4 months an increasing number of SCP-2431 instances refused to refold into any shape other than that of a crane. Result: Aggregates split into 150 new instances. 147 instances refold, as demonstrated previously, into a shape similar to that of a crane. The remaining 3 instances refold into the numbers 0, 0, and 0. Further attempts at testing with SCP-2431, following experiment 15, have resulted in aggregate instances refolding into either human shapes resembling the Japanese deity Fukurokuju9 or the Kanji Characters 愛子安達. As of 12/05/2013 testing is suspended until further notice. The following is an up to date profile of Aiko Adachi maintained by an undercover Foundation physician from MTF-Chi-7 "Plague Tamers". Occupation: Children's Writer, Japanese mythology. Recently Written Works: Momotarō, A tale of Growing. Sadako Sasaki, the tale of a girl and 1000 paper cranes. A Japanese adaptation of the famous comic strip, Calvin and Hobbes. Children, and Ages: 2, 3 and 5 years old. Reason for Observation: Formerly Linked to SCP-2378. Believed to be connected to SCP-2431. Initial Report: Mr. Adachi was first connected to SCP-2378 on 9/3/2012 via DNA sequencing. Due to Mr. Adachi's status as a Children's Author, Foundation observation units screened his works closely for the emergence of any memetic anomalies. Despite this screening, Mr. Adachi displayed no anomalous properties or connections other than his connection to 2378. On January 3rd, 2013, Mr. Aiko Adachi was diagnosed with Creutzfeldt–Jakob's disease, shortly before 2378 was due to undergo a transition event. SCP-2431 was discovered approximately 2 weeks prior to this diagnosis, and despite genetic flags to Mr. Adachi's genetic pre-disposition to CJD, no link was made between him and SCP-2431. He continued work on several publications in the months following his diagnosis. Despite continued care and observation, his condition has significantly declined over the past 5 months. He was officially hospitalized on 8/6/2013 when a fall resulted in a fractured hip. Since then he has been bedridden due to decreased motor function, increased memory loss and overwhelming dementia. 11/15/2013 Mr. Adachi is in the late stages of Creutzfeldt–Jakob disease. He's begun experiencing severe grand mal seizures over the past couple days. He's also currently being kept on a respirator, due to increasingly weak lung function, and is no longer capable of moving on his own. His daughters and wife come by every day during visitation hours. The wife brings some of the books he's written and reads to him and the children every day. The children bring drawings and toys, sometimes flowers or chocolates. Update 11/20/2013: Mr. Adachi has developed a fever, and racking coughs. We believe it's pneumonia. Update 11/21/2013: Tests came back positive, Streptococcus pneumoniae. We've put him on antibiotics. Update 11/30/2013: Mr. Adachi has responded positively to the antibiotics, chest inflammation has almost completely settled, though his dementia remains severe. Update 12/05/2013: Pneumonia is back, we're trying antibiotics again. 1. 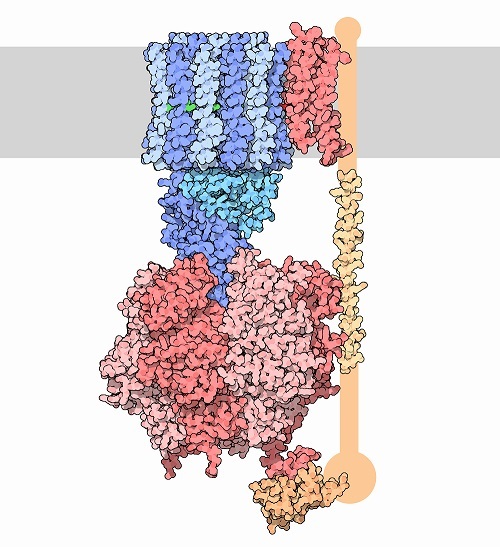 The protein primarily responsible for generation of ATP in the electron transport chain within mitochondria, with similar structural and functional components across all domains. 2. This occurs despite a lack of visual sensory equipment. Foundation researchers currently believe individual clumps may have some sort of complex nervous system in place through slightly altered variants of the misfolded protein. Research on techniques to explore this possibility are ongoing. 3. Due to coding errors and conflicts with biological terminology, access to Addendum 1 currently requires navigation to a separate page and level 4 research credentials. The link is attached at the end of this section. 4. Believed to be the result of "lost" memories, which enables instances to reenact otherwise previously unobserved narratives and behaviors. 5. Research into the mechanics and possible biological implications behind these capabilities is currently underway, though attempts to discern possible neurological analogs to emotional centers in the human brain have proven fruitless thus far. 6. A popular Japanese folklore hero sent from heaven in a peach. 7. It is currently believed that Research Assistant Bates was discussing his wife with a colleague during a previous experiment, and admitted to pulling out a photo of his wife and children within full view of an aggregate. 8. Japanese legend holds that if a person creates 1,000 paper cranes they will be granted one wish by the gods. 9. One of the Seven lucky gods in Japanese mythology, usually associated with longevity. He is frequently depicted with Cranes and Turtles.